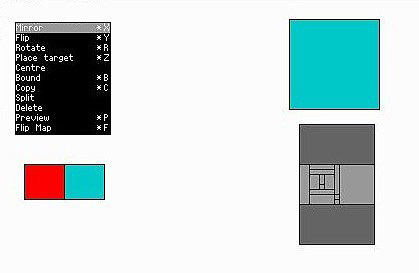 In this tutorial I will try to show how to make a room with a mirror which shows Laras reflection in it. The first step is not hard but the reflection part can be very frustrating to do right. At least for a beginner. And yes, I'm talking of my own experience about making a fully working mirror. The only experience you really need following this tutorial is a few days of trial and error with the editor. You also need some basic knowledge of the script files. I will try and explain everything I can in detail but the basic stuff like how to make a room, making doors, saving the project etc I will leave out. Same goes for the basic script tasks. Why so? Well there are tons of tutorials for that and don't forget the official manual! Also, a mirror room is not the first room you should try and do! If you are reading this and have yet to build a single rooms using the TRLE I strongly suggest that you wait with this until you have some experience of building a few basic rooms! Note 1: There are a few things you have to worry about before making this mirror project. Scroll down to the end and read for further info and credits for the people who discovered them. Note 2: In my example I use a room in which I already have a few rooms built. Just ignore these rooms (to the right of the mirror project in 2d view) as they have nothing to do with this example. Note 3: I'm from Sweden and I use a Swedish OS. 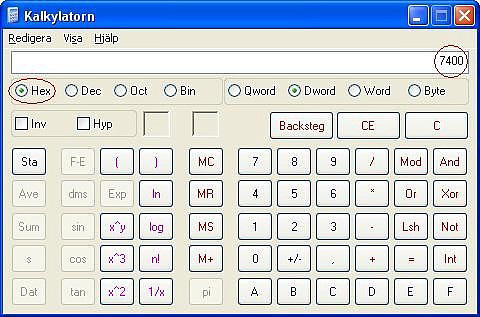 Hence the strange words in the explorer and calculator pics. I'm pretty sure that you can navigate using these pictures anyway, as the menus are on the same spots in most of the languages. As I said earlier, this is the easy part. At least if you have some experience in working with the TRLE. 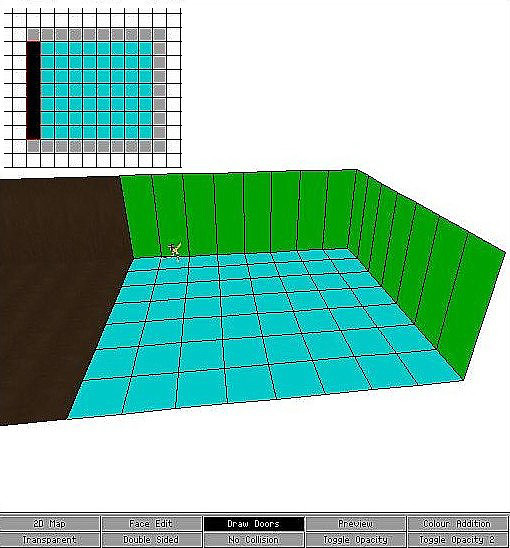 In this example I will show the easiest way of making the mirror rooms. I can already hear you say Did he say rooms? Is it more than one room? I'm afraid it is. To make the mirror you have to trick the editor into fooling yourself in seeing one room with a mirror. Sounds complicated? Nope its not! The whole idea is the make two rooms and put transparent textures between the rooms. The problem is the reflection but more of that later. First of all you need to make a room. 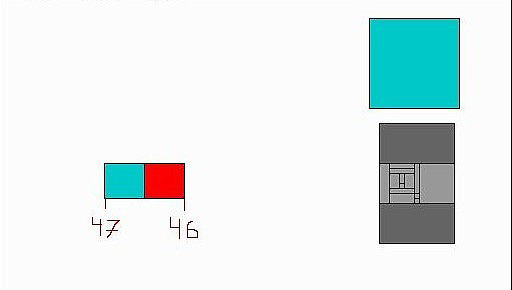 In my example I have built a room of 7x8 squares. (Feel free to make it any size you want.) The height of the room is 12 clicks. The room number in my example is 46. ( I will refer to this room as 46 from now on). 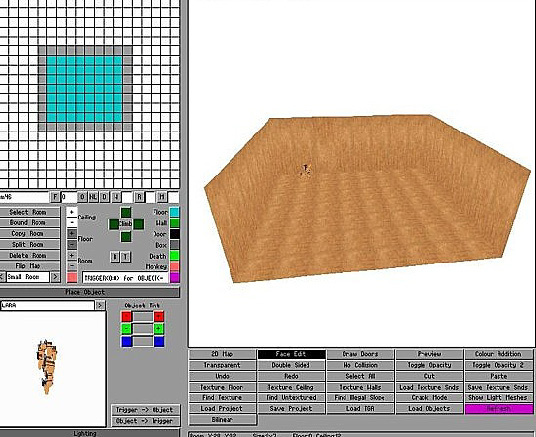 Your first task is to texture the rooms walls, ceiling and floor. It is not important right now to make anything special. Just make sure that there are no black holes when you run the game later on. 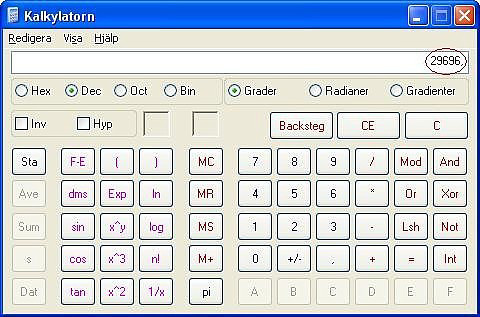 Use your right mouse button and highlight all squares in your room and click on the copy button. You should now have an exact copy of room 46. In my case the new room is called 47. Highlight room 47 and choose mirror from the room dropdown menu. Room 47 is now a perfect mirror of room 46! You now have to make a door between the rooms. Make sure that you put room 47 to the left of room 46. 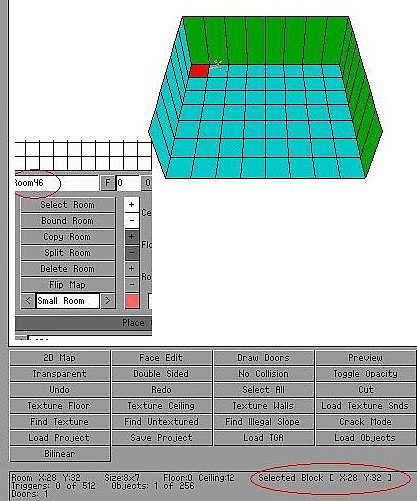 Highlight room 46, switch to 3d view and make a door on the whole left side to room 47. Now you need to make the doors between the rooms transparent. Make sure that Face edit is on and you are in room 46. 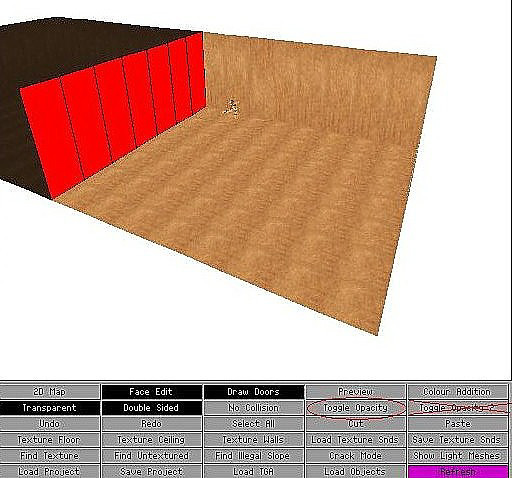 Highlight the door to room 47 and click on toggle opacity so the door will be highlighted red. Repeat step 5 starting from room 47 and apply the same textures from that side. This part is tricky so make sure that you follow these instructions exactly before going on further on your own. Also, don't forget to read the notes at the end of this tutorial first!! I will try to make sure that you don't fall into any pits but it's up to you to backup your scripts!! Ok don't be afraid. It is not as dangerous as it sounds. I just want you to be careful ok? Now its time to leave the editor. You can save your project now if you wish. 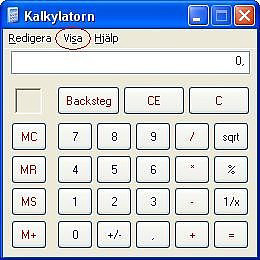 Use the built in calculator in windows and turn it into advanced mode by clicking on advanced from the view dropdown menu (visa in my example). We now have to calculate a formula using the X coordinate. You did write it down right? The formula is: X+1*1024. In my example that makes 28+1*1024 = 29696. Check the hex button and see how it turns into something else. In my case 7400 but don't be surprised to see letters combined with the numbers. You now have the hexadecimal numbers of the formula and unlike the decimal 0-9 numbers we now have 0-9 + A-F to worry about. If you are not interested in that and want to keep making the reflection work just write down the outcome you get in hex! Important! If you are using the new TRNG game engine to build your mirrors rooms, you will require different script entries to get them to work. In addition to the usual mirror rooms, you can now have mirrored floors and ceilings. You will find the new scripts in the TRNG Mirror Room section below. 46 is the room number and the value is the hex numbers you wrote down earlier. 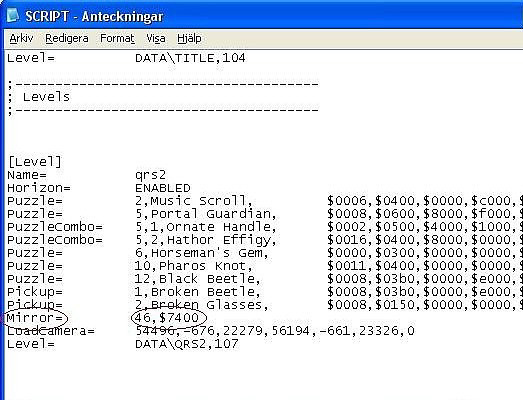 Save the script file back to itself and double click on the English. bat file. Now you will need to set better lighting, shadows, objects, better textures etc. to really get the right feeling but I leave that to you. There are a few things you should be aware of before making this project, otherwise the reflection will not work. There might still be other factors that I'm not aware of. I will update this tutorial as soon as I find out. ALWAYS make a copy of your script files. 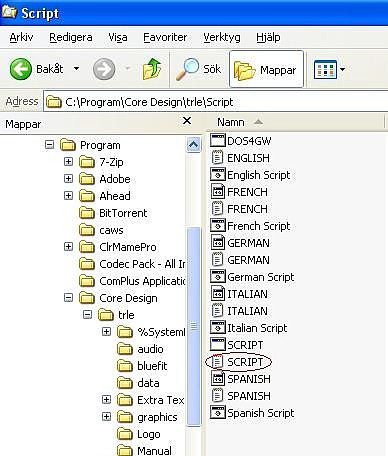 Why not the whole script folder just to be sure? 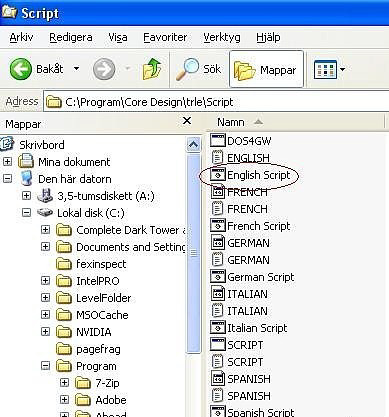 Don't forget to run the English.bat file after changing the script. It can save you from a few frustrating hours of things not working. A huge thanks too Oxy and Essgee for the information and help in understanding how to make a mirror with reflection. A special THANK YOU! To George M for helping me put together all this info into a tutorial with pics and text. Also for hosting the tutorial! Good luck in making a mirror project and feel free to use, copy and spread this tutorial as much as you like. In addition to having the usual mirror rooms, you can now have mirrored floors and ceilings. However, to get your mirror rooms to work in the new game engine new scripts are required. MirrorEffect= replaces the old Mirror= command. In reality the old Mirror script command still works but you can't use the new mirror type with the old Mirror command. The room number in front of the mirror. This is the real room which Lara will be able to enter and move around in. 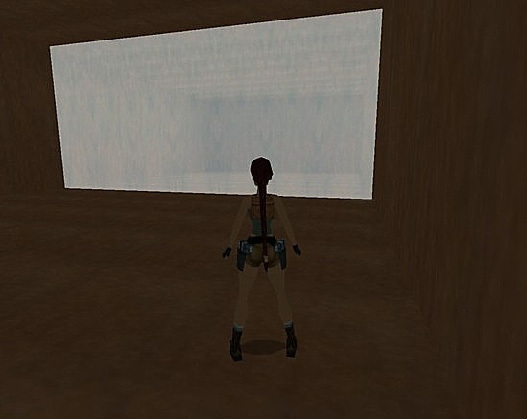 The room number placed behind the mirror, which Lara can't enter. West wall is the setting used for the old mirror. The west is the position of mirror from Lara's position looking at the room in the NGLE. The mirror will be over the floor of InFront room. Mirror on the ceiling of InFront room. Note that if you wish use a ceiling mirror it's advisable to use a very low ceiling otherwise Lara won't be able to see her own reflection in the ceiling. Inverse west is a horizontal mirror on the west side of InFront room, like the MIR_WEST_WALL. however, in inverse mirror Lara and other objects will be inverted, as in the original Tomb Raider game when Lara met an alien double. From this field you can set one (zero) or more indices of animatings present in InFrontRoom. Using this array the engine will replace all your animatings in the correct position and orientation in the hidden room to simulate their mirror image in accordance with the mirror type. Note that you have to place a couple of animatings: main animating you place in the desired position in InFront room, while the clone of this animating is place in the hidden room. It's not necessary to place the clone animating in the correct position but it's useful to place it in the same line (vertically or horizontally, in accordance with the mirror type) to permit to engine to find the right clone for each main animating. If you are using a vertical mirror, place the main animating in InFront room where you desire and with the desired orientation. Then place another animating of the same type in the hidden room. In this situation it's important that you take care to place the clone animating in the same vertical line (i.e. same sector in 2d visual) as the main animating. For horizontal mirror (like MIR_WEST_WALL) you have to place the clone animating in the same sector row where the main animating is. See the help file in the NGLE for more information about the correct position for clone animatings. Theoretically you can also type the indices of other moveables in the Animating array; in this instance the moveable will be dynamically updated. 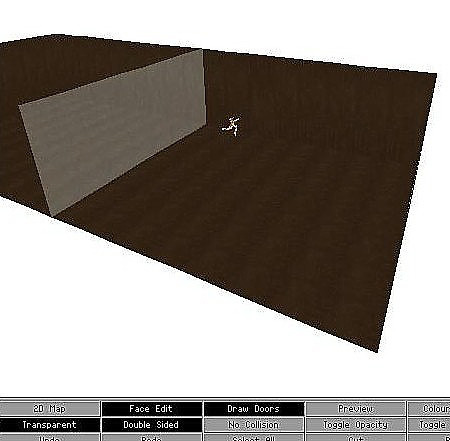 To work with moveables like enemies you'll have to place them in the hidden room while the triggers to enable them will be in the InFront room where the triggers for enemies in front of room are also located. The real room number is "30" and you must type this value in MirrorEffect command.